A staggering 89 percent of marketers are engaged in content marketing today, but only 19 percent think their current efforts are very successful, according to a recent ebook by Jay Baer. Not really, given that best practices are constantly changing, right along with innovations in technology and analytics. Yes, for content marketers who are trying to navigate this shifting landscape, help can be found in dedicated websites (like this one), books, conferences, webinars, and other content devoted specifically to the subject. But sometimes, when teams are struggling, there are more foundational challenges muddying the waters. I’m talking about process and productivity problems that derail even the most talented, knowledgeable, and cutting-edge content marketers—causing them to miss deadlines, work hours of uncompensated overtime, cut corners on quality, run out of time to evaluate the effectiveness of their work, and ultimately feel like tossing their laptops in a dumpster before moving into a van down by the river. And often, these process problems originate well before a single line of copy has been written and can doom a project to failure before it even crosses the starting line. As much as most of us would rather dive into a hot-fudge sundae, we understand the importance of eating our broccoli first. And even though we’d rather spend all our time producing wildly creative content, we do have to address boring things like workflow in order to make more room for creativity. 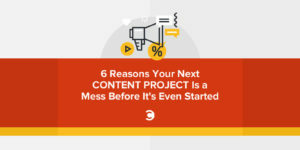 By all means, continue learning, experimenting, and working directly on your content marketing skills, but the only way you’ll really have a prayer of churning out quality content on a consistent basis is to clean up your pre-project processes. And that means combating the six common pre-project pitfalls outlined below. As tempting as it is to say “yes” to every request from every friend at work, stop first to consider the potential consequences of your other work, such as missing other important deadlines, cutting corners on another content project, or staying late to fit everything in. “In general before you say yes, you want to think strategically about what advantage doing something has for you,” said Susan Newman, Ph.D., in Forbes. But it’s difficult to think strategically if you don’t have a solid grasp of what’s in your work queue right now (see #5 below). If you do have to turn down a request, Newman suggests saying so in person—so your intent won’t be misconstrued—and keeping your explanation short and simple. Busy content teams may be rushing so fast that they don’t stop to build an effective creative brief. (Ironically, the busier you are, the more important such formalities become.) It’s also difficult to pause long enough to make sure each content project is aligned with company objectives or to evaluate how it will generate value or ROI. In short, you don’t have time not to stop and get clear on the details before you begin a project. While 41 percent of marketers say they are very committed to content marketing, only 37 percent have a documented content marketing strategy, says Baer. Without a visible plan to work toward, it becomes much more difficult to keep a content team unified and pushing toward common objectives. Meyer’s firm plans quarterly. For them, it’s all about being agile. “Planning three months ahead lends us enough time to fill our editorial calendar without rushing or scrambling,” she writes. “It leaves enough room for us to quickly adjust our plan so we don’t miss out on timely events and topics.” And yes, she’s a strong proponent of documenting that strategy. Ever heard of the Checklist Manifesto? If it can keep airplanes from crashing and surgeons from leaving forceps inside patients’ chest cavities, it can keep content marketers from making catastrophic mistakes as well. Have you clearly outlined all the steps required to execute each content project type? Are you leaving out a round of approval? Are you forgetting to save the final approved version in the DAM? Are notifications happening for the right people at the right times? Danakos follows different checklists for different content types, from supporting events and video creation to social copy creation. Besides simply listing each step, you also need to know the amount of time each one takes. Steps one through five might take five minutes, or they might take five weeks. Your workflow will be much more powerful when you know. Comprehensive work management software makes all of this even easier—and more visible and predictable—by streamlining your process from beginning to end, including customizable templates for different project types, built-in collaboration tools, instant notifications for contributors and stakeholders, automated reviews and approvals, and more. Content marketing moves at such a fast past that it’s nearly impossible to keep up with your own tasks, let alone understand what others on your team are working on. Meyer’s team cranks out 19 content pieces a quarter, of all different types, all at different stages of completion at any given moment. My own small team of five marketers completes about 75 projects per quarter, ranging from blog posts and ebooks to webinars and video content. The only way we can keep up with it all, given our limited resources, is by relying on a “single source of truth” for all planning, deadlines, communication, proofing, and more—our work management software. I know many teams struggle to keep up with a similar content load while jumping between multiple disconnected tools. You have to communicate here, then toggle to this app to check a deadline, then jump over to that spreadsheet to check your budget, then email your team to find out who has available bandwidth for an upcoming task. It’s the ultimate visibility killer. According to a 2014 survey, 42 percent of marketers use six to 10 different software programs during the course of the day, another nine percent use 10 to 15 programs, and another nine percent use so many that they’ve lost track, poor souls. If you can’t see your team’s progress against this week’s goals, how can you know where things will stand next week, let alone by the end of the month? This kind of uncertainty makes it impossible to estimate future deadlines. You want to make people happy, so you just blurt out what you think might be a possible date—one that will satisfy the requester. Unless your estimates are based on real observation and measurement, these estimates are likely going to be proven wrong, and your delivery dates will be blown again and again. The right work management tools will give you visibility into how long the individual steps of work take you, so you can tweak and adjust to match the trends you’re seeing. 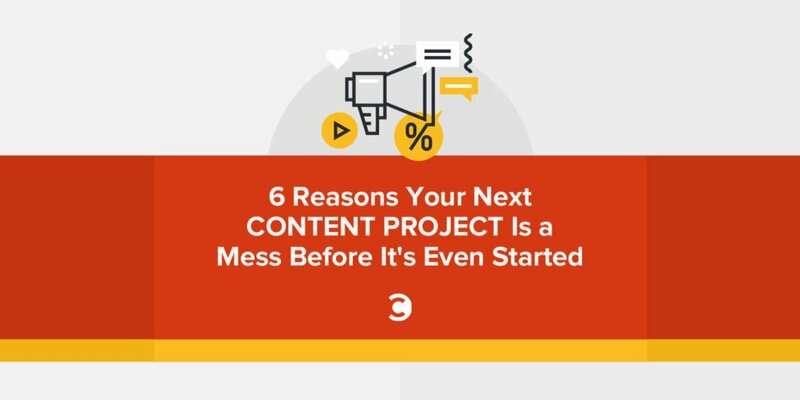 Over time, you’ll get better and better at estimating when you’ll really be able to deliver your content projects—and stop the constant overwhelm in its tracks. Even the busiest content teams must take the time to examine their underlying business processes and workflows, starting with how they receive, process, prioritize, and plan incoming request—to eat their broccoli, so to speak. Your content could have immense audience appeal, be targeted to the latest and greatest apps, and incorporate all the latest tech trends, but if you can’t produce results on a consistent and reliable timeline (without burning out your team), you won’t be living up to your content marketing potential. “Make sure that you’re nurturing your process,” writes Todd Henry in his book Die Empty: Unleash Your Best Work Every Day. “It’s the only thing you can truly control, and it’s the thing you’ll always have regardless of where you end up”—unless, of course, you end up living in a van down by the river.